A report from John Dowdy on the Social Security Amendments passed in 1965; The report explains the major provisions of the Social Security Amendments and compares these provisions to the older Social Security system. Dowdy, John. "Your Congressman Reports: Social Security Amendments." 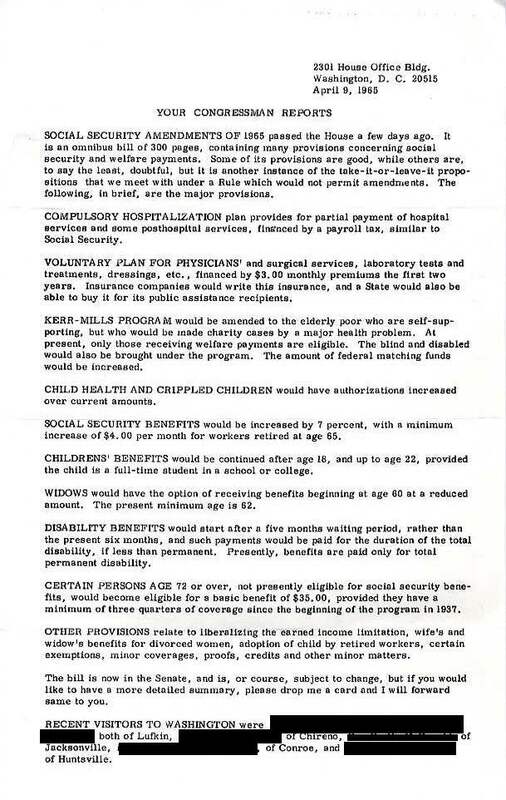 John V. Dowdy, Sr. Papers, Box 491, File 67, "Your Congressman Reports: Social Security Amendments," April 9, 1965, W. R. Poage Legislative Library, Baylor University, Waco, Texas.. Accessed 19 April 2019. http://acsc.lib.udel.edu/items/show/261. Social Security--United States. ; Health care--1960-1970.; Dowdy John Vernard, 1912-1995. John V. Dowdy, Sr. Papers, Box 491, File 67, "Your Congressman Reports: Social Security Amendments," April 9, 1965, W. R. Poage Legislative Library, Baylor University, Waco, Texas.